For two years now, The Urban Prehistory Gallery has been producing a series of lovingly constructed miniature versions of prehistoric monuments in urban locations. In this post, to celebrate the 50th miniature to roll off our production line, we decided to give you an insight into the magical process of creating an Urban Prehistory Gallery miniature, from conception right through to the production of the finished piece of work. We hope you enjoy this rare insight! 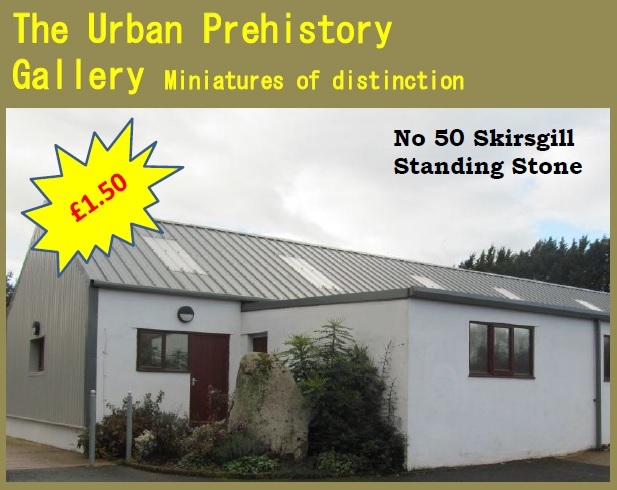 Each and every Urban Prehistory Gallery miniature is handcrafted by our team of skilled sculptors in our studio in Airdrie in the heart of North Lanarkshire. 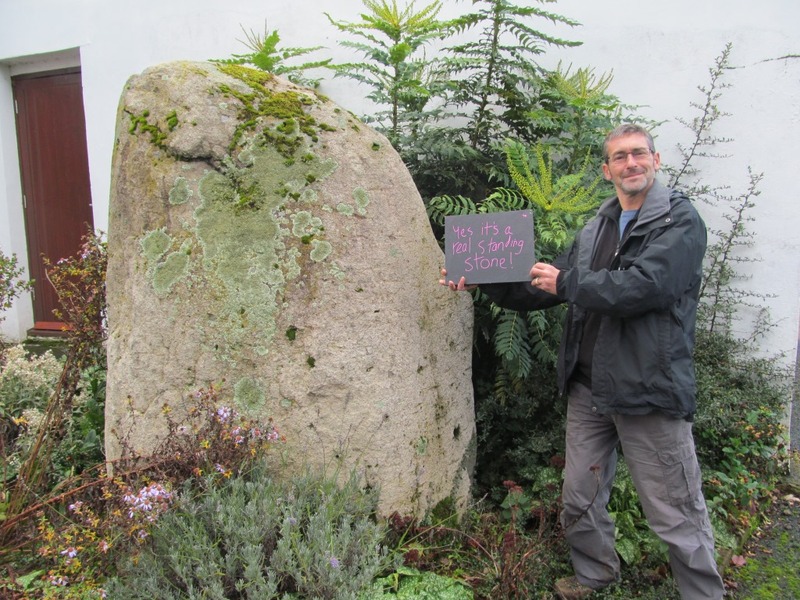 The prehistoric monuments that dominate out range are based on real sites and many followers of our blog enjoy touring the country visiting industrial estates, suburbs and road intersections in search of the actual standing stones, Bronze Age cemeteries and flattened earthworks. From site visits, photographs, the internet and sketches, up to two different processes then follow to produce a complex mould from an original modelling sculpture made from Babybel wax. There is no room for error, and the original cheese wax sculpture may melt during the process. Every notch, carving, obscene piece of graffiti and lichen stain is individually applied by hand to build up the different textures and details. Flexible cardboard moulds are then used to cast faithful replicas of the cheese wax original in a specially licenced material called Amashite (TM pending). Once this has set, the moulds can then be carefully peeled away to reveal every last detail on the cast model. A cheese wax model of a standing stone (in this case made from Babybel Gouda) showing an early stage of the process. 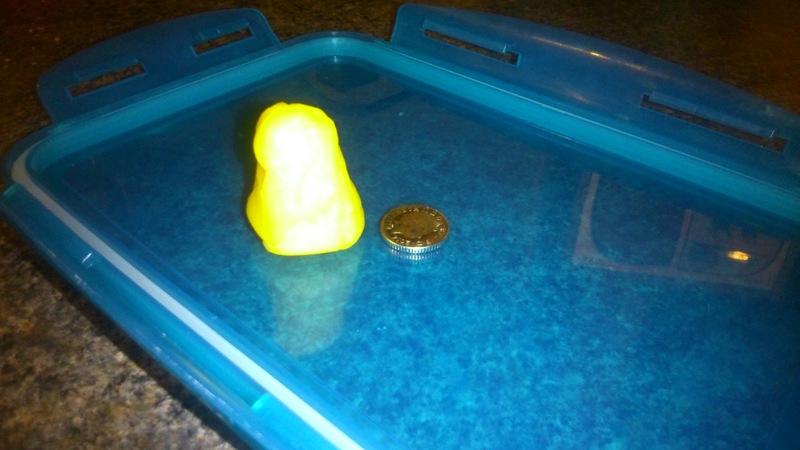 5p for scale. After being dried in a cupboard overnight, the model passes to one of our painters, who is – remarkably – the same person who has done all of the work to date. Up to 50 different shades of grey can be tried and checked for authenticity before a master version is chosen for each monument. The exhausted painter then has to match each of the models they paint to the master version, to ensure that each bares a passing resemblance to one another. Finally, the miniature versions of monuments have green cotton wool glued to their base to replicate grass, and are labelled, before a final quality check ensures that they leave The Urban Prehistory Gallery in perfect condition, or at least reasonable ‘seconds’ quality. The latest product of this painstaking process is the delightful single standing stone, Skirsgill. This delightful early Bronze Age megalith occupies a striking industrial-unit-corner location amidst a bouquet of wild flowers and weeds. Our miniature version of the stone captures perfectly the moss and lichen that adorn this stone. Exquisite craftsmanship ensures that even the carved motifs G P and M R are depicted on this miniature object. This particular standing stone was chosen not just for its charm but also for its historical interest too – constructed over 4000 years ago, it is one of the oldest contained within our collections. There is delight to be had from the knowledge of the location too, situated outside a whitewashed building that was once the visitor centre of miniature cottage manufacturers Lilliput Lane. Nothing further is known about this standing stone and so it is our dearest wish that this miniature has captured something of the mystery of this enigmatic testimony to the skills and ingenuity of the ancients. The Urban Prehistory Gallery is proud to announce that on the occasion of our 2nd birthday and 50th creation it is now possible for you to join the The Urban Prehistory Gallery Collectors Club. 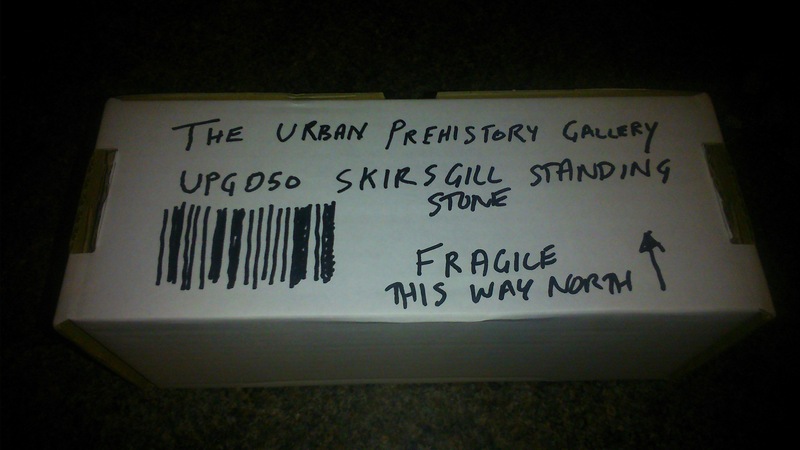 Membership is free, and you can join by following this blog, or the @urbanprehisto twitter feed. Membership benefits that may be introduced in the future (subject to the levy of a small fee) include receiving a certificate of membership, a hat, some badges, a thrice yearly newsletter full of adverts for middle-class products and life insurance, and a personalised standing stone. Notes, sources and acknowledgements: Much of this post is a parody of recent Lilliput Lane catalogues. 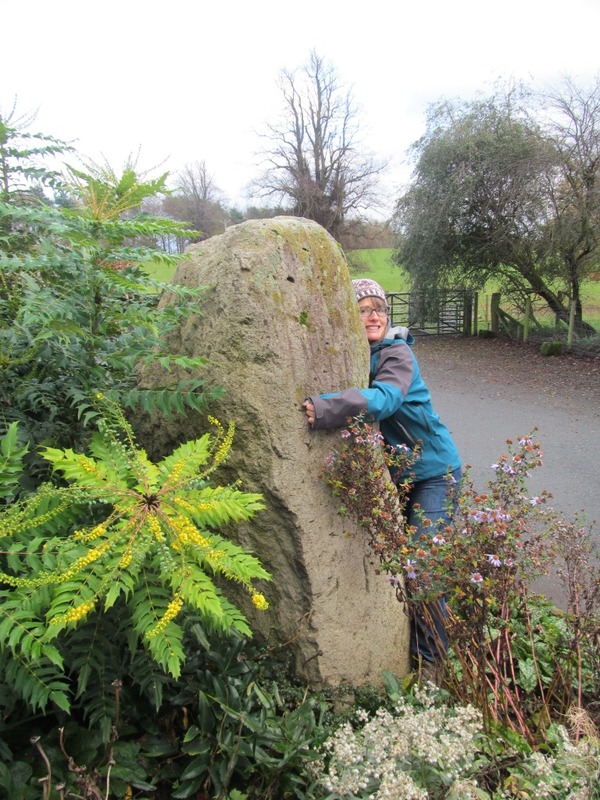 Almost nothing is known about the Skirsgill standing stone, although there is a little information here. The standing stone is a scheduled ancient monument. On my visit to the stone I was accompanied by Jan, the esteemed Dr Mills and the equally esteemed Dr Pannett. Sir, I like the cut of your jib.